On a rainy night in King’s Cross, London about eight years ago I wandered past the Shaw Theatre, a backstreet venue mostly used for corporate presentations, and saw that Michel Legrand and his orchestra were appearing there. 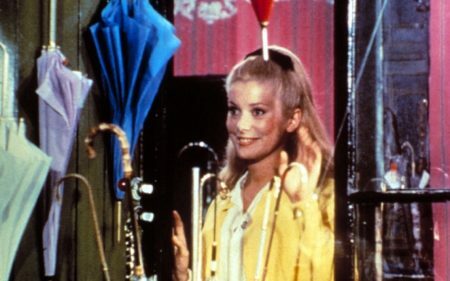 In his eighties then, he was onstage for at least three hours and worked his way through an entrancing back catalogue that included music for The Thomas Crown Affair, The Umbrellas of Cherbourg, Summer of ’42 and the film below, which starred Catherine Deneuve and Gene Kelly. His music was always closer to the freeform jazz of La La Land than anything more traditionally stagebound, and has stood the test of time. He died at 88 this week. I think Legrand’s score for the 1971 film ‘The Go-Between’ is his greatest achievement. His music was so lilting and always recognizable. Captured a romantic innocence. Unique talent. He did great compositions and arranging work, but he was also a really good jazz piano player. I don’t think he’s ever been properly recognised for that. is my favourite Legrand score. The sense of elation and exhilaration in the music beautifully encapsulates the mood of Jeanne Moreau’s character and her fun winning at the casino table. Where Have All The Heist Films Gone?